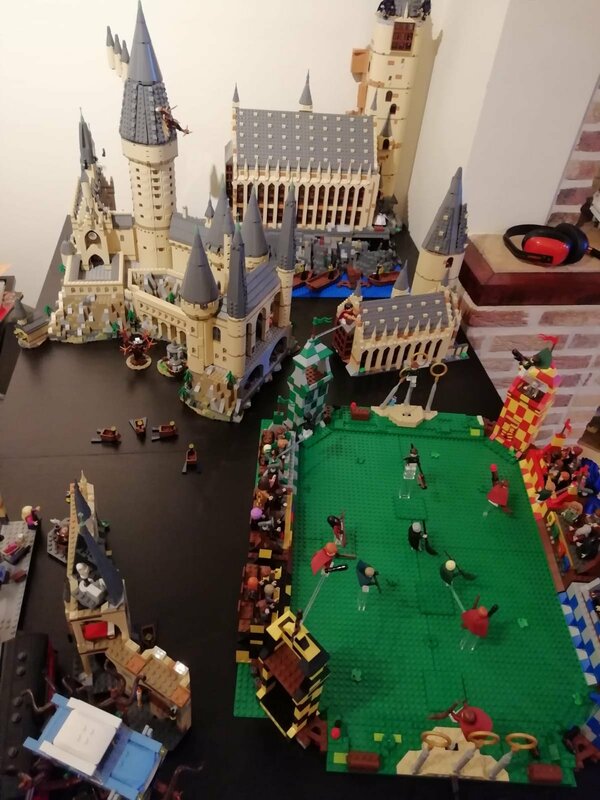 After building #71043 Hogwarts Castle, my family started asking to add additional locations that existed around the grounds. I'm not quite ready to tackle the rest of the castle as some builders have done, so I thought that a quidditch pitch might be a reasonable thing to start with. 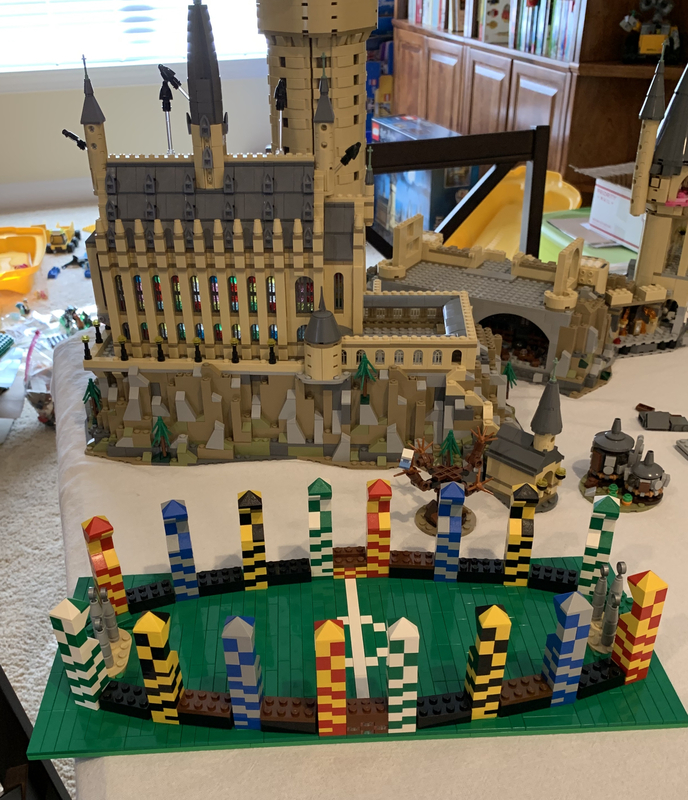 I've seen online that the quidditch pitch is supposed to be 500 feet long by 180 feet wide at the center, but I don't have a good feel for how large that would make it compared with say the Great Hall in #71043? Does anyone have a good guess as to how long or wide the Great Hall is to help me make a pitch in the same relative scale? I was initially guessing the pitch should be around 48 studs long, but that seems a bit small when I lay it out. I believe she put together something similar recently. 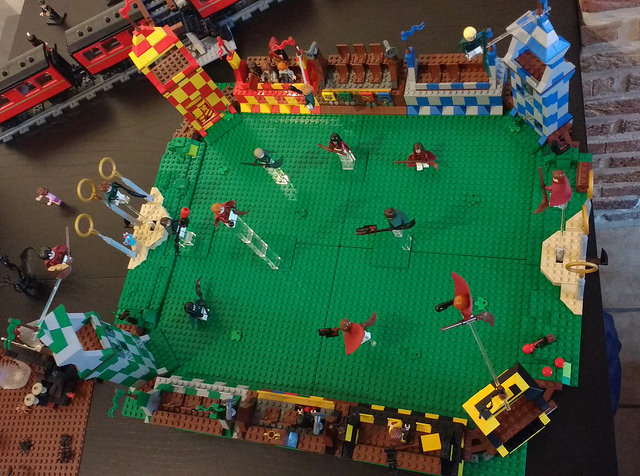 I can't seem to find her photos of the project, but I'm almost positive a Quidditch Pitch was among the builds. May be some good reference material for you? 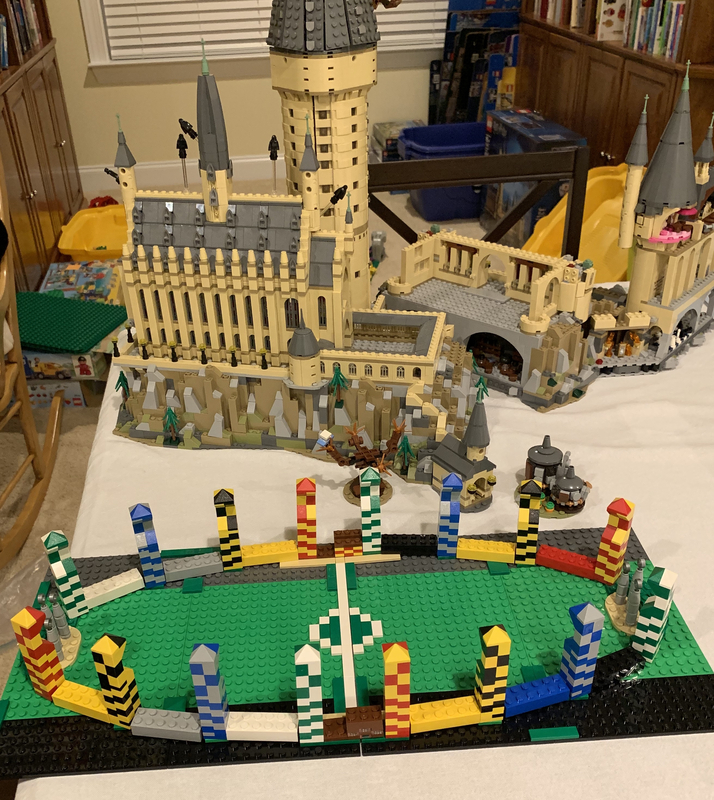 Tomorrow I will put this pitch (on approximate 4 baseplates and a bit extra) next to the Hogwarts Castle (and take a picture) so you can judge it scale-wise. My reason for this scale was mostly to get some nice stands in there. I've already made a pretty huge Hogwarts Hall (https://flic.kr/p/295CpvU) and my plan is to integrate the Castle into the MOD at some point too. Thanks for the picture @snowhitie! I had been thinking about making a pitch that was a better scale for minifigures. (I did buy two #75956 to start.). But right now I am looking for something that will be closer to the scale for #71043. I’ve been eyeballing the Great Hall and think that the field needs to be closer to 60 studs by 22, not counting the stands. (Which probably puts it closer to 66 by 26 studs total.) If the great hall is around 50m (164 feet?) then the pitch would need to be 3 times as long to reach 500 feet. The interior of the great hall is 20 or 22 studs, depending on how you count the doors. So somewhere in the 60-66 stud long range should be right. (Assuming 164 feet makes sense as the length of the Great Hall.) All guess work at this point! Here was my first attempt to MOC up the dimensions. It is only 45 studs long and doesn’t look nearly long enough compared to the Great Hall. I didn’t bother decorating the stands yet, so this just a rough approximation of what it will look like in the end. ^ I really like that setup, very good MOC. Yes, mine is a total different scale. 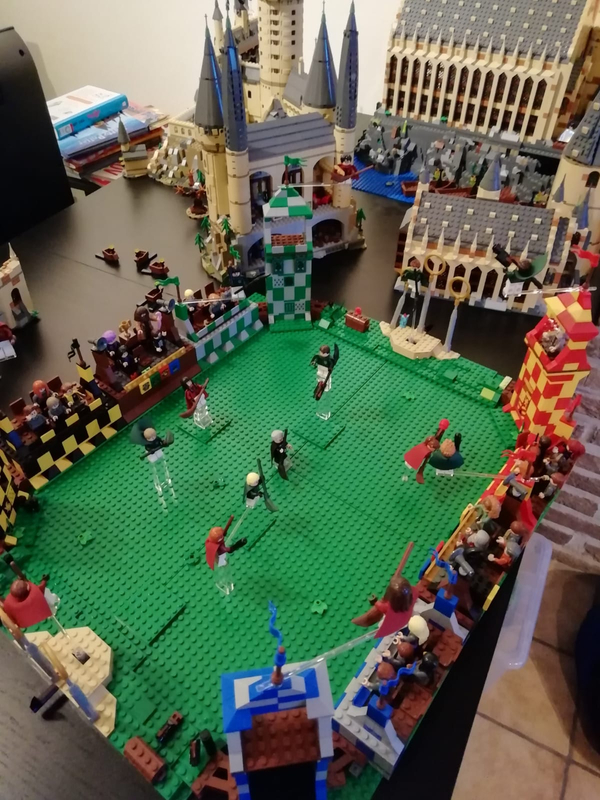 Still I promised you a picture, so I moved it back next to the microfigure scale Hogwarts and also finally got my stands filled up with students and teachers. It is a very different thing then how you are doing it, but maybe it helps you judge the scale. Thanks for sharing @snowhitie. I like the stands you created for the figures. I tried spacing out the pitch using 6 studs between each viewing stand to add additional length. (Originally it was 3, then 4 studs between each.) With the stands, it will be 63 studs long by 30 studs wide. I am going to need more green tiles to cover the full pitch at this point! Not to mention all the 1x1 plates it will take to make the stands! @Ronyar ; - They quite often have those in pick a brick walls. If you're near a Lego store, it would be worth checking that before Bricklink. I'd be happy to check my local store this weekend. Not sure where on the planet you're based though. Edit - I see your in the US. Happy to take a look still. Shipping UK to US is a lot cheaper than vice versa and 200 1x1 plates wouldn't weigh much. Someone reading this in the US might be able to help you out as well. Thanks for the offer @Brainslugged! I will probably be near a Lego store this weekend, so I'll need to take a peek. Not worth shipping all the way from the UK, but I do appreciate your willingness to do so!